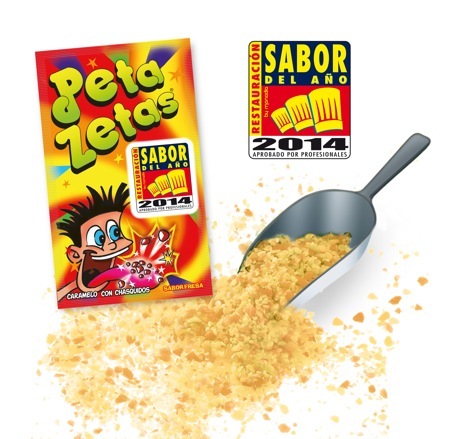 Rubí (Barcelona), 2014, March – For second consecutive year Peta Zetas® popping candy has been awarded the Flavor of the Year – Foodservice 2014 Award, in the Ingredient category. This Award is specially celebrated since it recognizes the leading position of our popping candy as an ingredient for the foodservice industry in the company´s 35th anniversary. Peta Zetas® has come to be the most surprising and innovative ingredient in the food service industry. To satisfy the increasing demand of popping candy for artisans, chefs and multinational food companies, Zeta Espacial created the Popping Candy in Bulk division, which offers a full range of popping candy products in different presentations to suit the needs of each industry. Peta Zetas® adds a special touch of creativity and innovation to multiple applications when used as topping or filling in chocolate creations, ice-creams, yogurts, cereals or bakery, among many other possibilities. As Mr. Escolà, President of the company states, “The only limit is the imagination”. And whatever the application is, results are always surprising. 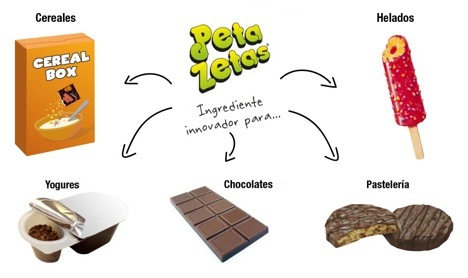 Peta Zetas® is the most innovative ingredient for the avant-garde cuisine. Ferran Adrià, Arzak, Oriol Balaguer, Heston Blumenthal, Enric Rovira and other highly respected chefs around the world trust Peta Zetas® to add a special touch of fun and innovation to their creations. Since 1979 Zeta Espacial S.A. is the leading manufacturer of popping candy worldwide and it also manufactures a full range of other confectionery items. Zeta Espacial exports their products to 60 countries worldwide and has 2 subsidiaries in the American continent. The basic premises of the company are innovation, internationalization and high quality. The “Flavour of the year” Award is the only food quality award that is based on blind tests and sensory reviews done by consumers and chefs. The food products are tasted and evaluated in their different categories according to various key aspects of the foodservice world: ease of use, appeal to consumers, flavour and global evaluation.